This is part 2 of a 4 part series on forgiveness. Part 2 in this series covers how to apply forgiveness in your relationships to allow them to grow. 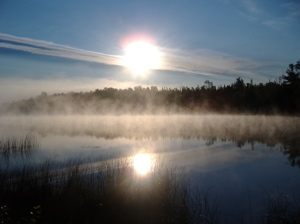 Misty morning sunrise at Carney Lake State Park near Iron Mountain, MI. We all make mistakes. We’re all capable of hurting each other. We all have different opinions, and we all think that we are right and that all opposing views are wrong. Whether it is about political, social or religious issues or about who’s done more dishes or changed more diapers, or that every other driver on the road is discourteous and stupid, except me, we all believe our actions and feelings are justified and that theirs are not. The truth is, it doesn’t matter who is right. No amount of arguing, angry demonstration or outbursts will convince another person that we are right and they are wrong. Instead, it will lead them to defend their position more strongly and think less of you. Reflect on our own contribution to the problem, resolve to disagree when your spirit says to do so, and let it go. This is not to say that we will not experience anger, or that we should not hold others accountable for their actions. Rather, reflect on your part, express your feelings and let go. As with anything else in life, when you focus on the things with which you are dissatisfied, they will multiply in your life. When you focus on the the things that make you angry about someone you love, you will become more angry and your ability to love will be impaired. When you focus on the things you love about that person, your love will grow. This is not easy to do when you are angry, but can be done gradually. Going from a place of annoyance, frustration and anger to a place of admiration and love is not easily done, especially in the middle of a conflict. I find that often times, it requires solitude. If I am frustrated with my wife, I often have to take a few moments away from her, instead of trying to feed an escalating argument. I start by recognizing that there are things that I am displeased with. From there, I recognize that these are things that I can live with because I love her and want to enjoy my life with her. Then, I ask myself why I love her, what is it about her that makes working through this conflict worth the effort. I remember what it was like when we first met: the intriguing sparkle in her eyes on that night. I remember when I decided to marry her and how she collapsed in my arms when I asked her. I focus on the things she does that make me smile, the times we laugh together, the times she listens to my deepest fears and frustrations. I think about her smile, how it lights up her face and how it always makes me smile. Within a short period of time, I go from amplifying all of the little things she does that I find annoying to marveling over everything about her, from her soft skin to her forceful, yet gentle and compassionate personality. Who is right? Who is wrong? It doesn’t matter. What matters is that I want to be happy. I want my wife to be happy. I want to have a strong, stable, loving relationship with my wife and peace in our home. For that, I don’t need to be right, I need to own my part and forgive. From here, if I still find the need to confront a conflict, it is with a desire to understand and resolve, rather than be understood and prove her wrong. Make a list of the things that you love about your significant other, a close friend or family member or someone you would like to be closer to, but have allowed conflict to get in the way. Focus on this list and marvel at it. When conflict arises and you are tempted to focus on everything you hate about this person, use this list to help you change your focus.